Fibre channel protocol analysis, traffic generation and performance test. AGILENT Technologies has released a multi-application fibre channel protocol analysis module for 4Gb/s fibre channel storage networks. The test tool combines fibre channel protocol analysis, traffic generation and performance test, allowing storage equipment manufacturers to reduce test equipment capital expenditure and test cost and accelerate test development. The Agilent 1735A multi-application module builds on the Agilent N2X testing chassis. It supports real time protocol analysis applications and is compatible with the Agilent storage area network (SAN) tester. Test automation is achieved through a common TCL/TK interface. By combining active test (traffic generation) and passive test (protocol analysis) on the same module it decreases the complexity of the test environment and the cost of the system. Downloading the appropriate features on the modules prior to the test makes it possible for the distribution of active versus passive ports. A traditional SAN test environment includes active test tools that generate traffic conditions needed to test all of the fabric and equipment capabilities, together with passive protocol analysers to transparently monitor traffic information within the SAN network. Significant challenges are related to the integration of heterogeneous test tools and various APIs in a common test environment. Since the ratio of active test ports versus passive test ports varies depending on the test scenario, only a portion of the test equipment is used at a time. When configured as a protocol analyser the module includes two independent full-duplex analysis subsystems. Each one is able to capture relevant information through a multilevel, multibranch triggering and filtering sequencer. Time correlation is provided between all of the analysers, enabling multiport, system-level measurement. 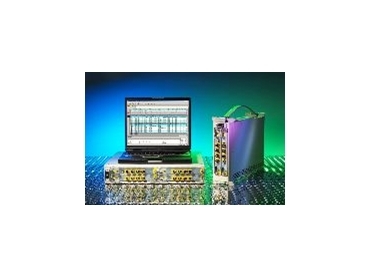 The product is a companion to the Agilent N2X multiservices tester for converging network infrastructures, combining routing, switching, transport and storage testers in an integrated solution. When configured as an active tester the module enables fibre channel traffic generation at wire speeds of 1Gb/s to 4Gb/s, with allowances for any combination of data, error, link, fabric control and fabric services test. The module can be used simultaneously with Agilent 1730 series SAN tester modules in the universal multiuser, multiprotocol, scalable N2X chassis, protecting existing investments. This chassis can be a portable two-slot version for mobile use or a stackable four-slot version for large-scale multiport analysis in a test integration lab. Traces can be captured onsite and viewed in the lab environment.